Images of a wall coming down are the last thing Berlin evokes today. Lush and romantic, this modern metropolis is making Paris just a little bit nervous. We walked down Unter den Linden hand in hand—piping-hot gluhwein in our other hands—before stopping in front of the Brandenburg Gate, or Brandenburger Tor for those of you who kann Deutsch. We craned our heads to stare straight up. It was bigger and more beautiful than I could have imagined. And, boy, was it freezing outside. So we stood a little closer. We turned to face the direction from which we came down an impossibly wide street framed in trees covered in twinkling white lights—a stark contrast from the pitch-black sky above. Romantic doesn’t even begin to describe that moment. Magic, something transcendent of us kids in love, was more like it. The type of moment Hollywood films would like you to think could only happen in Paris. Or, if you’re Woody Allen, under a bridge in Brooklyn at twilight. Romantic, luxurious getaways come in as many forms as there are couples to enjoy them. Berlin, Germany’s most beautiful city, is proof. 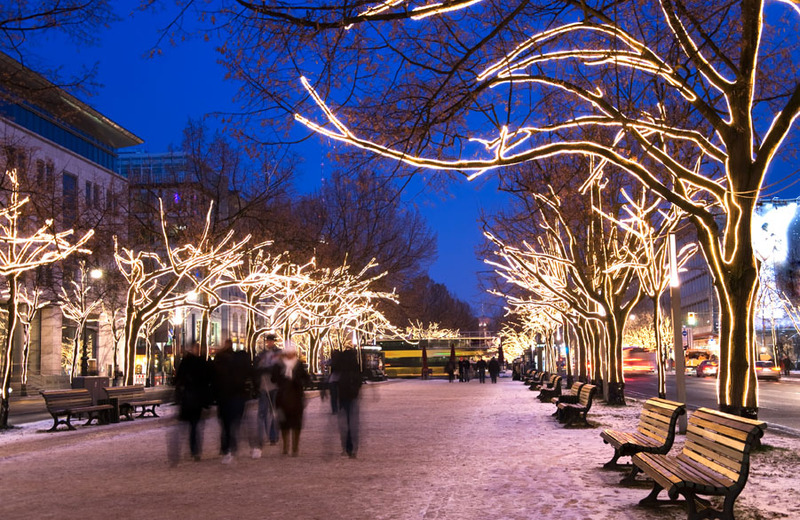 There are few cities more cupid-friendly during the holiday season. Rich with decadent foods, drinks and holiday spirit, Berliners go all-out to welcome St. Nick. And so did we. We were in college then, so we stayed in a hostel in Mitte, the city center of Berlin. If I had to do it again—and I’m dying to—I’d stay at the Keminski Aldon Hotel, a luxury fi ve-star resort also in Mitte near the Brandenburg Gate on Unter den Linden. The resort leaves nothing to desire—a full spa, great bars and restaurants, luxurious suites with outrageously romantic views. A bit touristy, perhaps, but also elegant and classic. Why not enjoy the comforts of home while traveling far, far away? This place is a far cry from our private hostel suite. Berlin, at once beautiful and austere, is also quite cold during the winter months. Do plan on wandering the city, as we did, but also plan on having plenty of hot German chocolate and include many indoor stops, too. For us, one of those well-planned stops was the Berliner Dom—a must-see for any world traveler and one of the most ornate and enormous Protestant churches in the entire world. When we set foot in the church, the sound of voices fi lled the air, like angels singing. A bit cliché, we thought, but clichés exist for a reason—and this one put us in the holiday spirit. We wandered through the massive entryway at the Dom and saw them: A children’s choir rehearsing for Christmas services. The church was mostly empty, with the exception of a few wayfarers and other tourists—couples, mostly. We took a seat to the left of center and enjoyed the serenade. Sublime doesn’t begin to cover it. The whole event was so stereotypically German. When the conductor waved his hand, the boys’ fell silent and sat down, hands neatly folded in their laps. When he was done giving notes, the conductor’s hands went back up, the boys stood up, and the singing recommenced on cue. Watching them was active meditation. And such obedient behavior from this choir would surely make any American mother yearn for better-behaved boys. What I remember most about Berlin was just how structurally beautiful it was. There’s much more to the city than the gray slab of Alexanderplatz, including massive public parks and genuinely incredible architecture. The streets were wide—many having had the “luxury” of being destroyed by war and rebuilt anew. And a suprise, the streets were extraordinarily lush—trees love North German climates. And the people—dare I say it—were consistently, remarkably kind and gracious. Then, there’s the food. My God. The food. Be ready to order eine tasse kaffee, or “a cup of coffee” at any and all of Berlin’s many cafes. The cappuccinos, although not made in Italy, are consistently world class. One must-try restaurant is Weinbar Rutz, owned by sommelier Billy Wagner. It features unique pairings in its so-called “inspiration” tasting menu, for which the chef typically uses foie gras, Waygu beef and radishes—a departure from sausages and schnitzel Germany is famous for. For dessert, it’s worth the trek to Fassbender & Rausch for some chocolate. The Schokoladen-Café features some of the most amazing sweets in the world, including hot chocolate, and assorted tartlets in flavors that would even make Willy Wonka drool: Red currant, chocolate mousse, forest fruits and tiramisu, among others. Grab a box or six for the flight back to Newark. Pralines and truffles never hurt a soul. For all the beer gardens, sausage carts and Christmas markets strewn throughout Berlin, it’s extraordinarily easy for the average tourist to get caught up in it all. For the sophisticated American traveler, Berlin should be all about relaxation, romance and, of course, fine dining. When we left Berlin it was snowing gently as we walked, no—jogged, our way to the bus depot. We didn’t want to leave this magical city—or each other—and so were dangerously late. It was an incredibly memorable night. With a little extra luxury—and maybe a well-run car service instead—imagine how wonderful your winter German getaway will be. I remember mine like it was yesterday. Who needs Paris when I had Berlin.